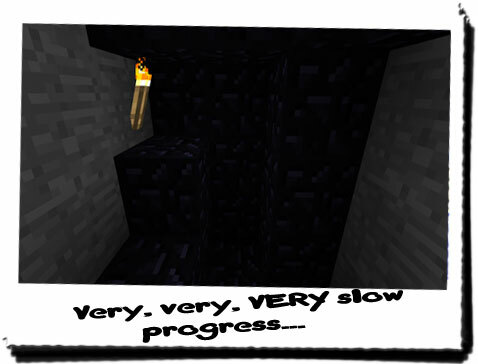 Diary of a Miner: Day 38: Whatever's behind this wall better be worth the effort! Day 38: Whatever's behind this wall better be worth the effort! I HATE SPIDERS!!! I had the same dream AGAIN!!! But this time, the spider killed me... again. I woke up suddenly drenched in sweat, only to find a rather large spider crawling along my leg! I know I'm not effeminate, but the scream I produced would've made a little girl look butch! I jumped out of bed and ground the spider into the floor with my shoe... for some time, making sure it was sufficiently dead! After that rather embarrassing episode, I took my bow and quiver and set off towards the boat; today, I was returning to the house to get the proper equipment for the job! I decided to leave Chiron behind; I was only likely to be a few hours at most, and he was unlikely to get into any trouble here! Just for security though, I fastened the zipper on the tent, and made sure he couldn't get out! I headed out towards the boat, placing the bag of stuff I prepared initially into the chest. I hadn't used much from the bag apart from a few bits of food, tools and the weapons! The tent and compass had been left untouched, the tent at least was acceptable. Although, in my defence I wasn't to know that tents would already be set up here! I pushed the boat off from the shore, and with the same efficiency as before, I made (an attempt at least) my way towards the wall! I really needed a more inspiring name for it... After about an hour or so, the white ship passed me by in the opposite direction, and I stopped rowing and got ready to secure the boat. I didn't want a repeat of last time. After the boat was steady, I stood up and walked straight onto the new pier and looked up at the wall; a nice familiar sight if I ever saw one! As the gate had a single control on the interior wall, I made my way back over to the hidden passage which took me to the South-Westerly tower! After placing the blocks back into place, I made my way along the dark and narrow passage and up into the tower. Replacing the wooden panel in the tower, I then climbed down onto the wall and admired my land! 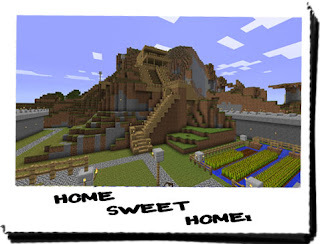 The house was intact, there were no Creepers or other creatures visible and all of my wheat had grown! Life was good! I climbed down from the wall and harvested all of my wheat. I was able to tie the wheat into sheafs with a bit of spare string I found back in the house after removing a wooden barricade, and I returned to the farm with a hoe to till the earth for more seeds! I still didn't know how long I was going to be, and even more wheat ready and waiting would be great! After replanting the entire field, I went back to the house in search of the diamonds. 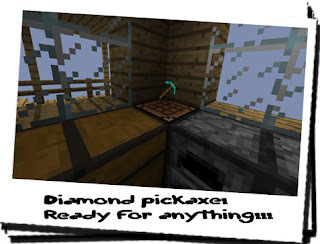 I knew I had enough to either make a fully diamond pickaxe and a shovel, or I could be frugal and simply apply a diamond edging to one of my pickaxes already in use! The problem with the latter was I had stupidly left my pickaxe back at the tents... So it seemed the most appropriate solution was to make a new one! Besides, it would be considerably more durable than an iron pickaxe anyway. Now all I had to do was find the diamonds... I couldn't remember where I had put them; I had checked every chest and crate in the house, and couldn't find it. 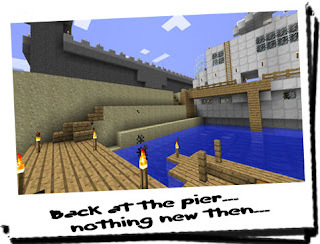 And after being distracted by a new search for TNT, I remembered I had hidden it to prevent it from disappearaing... Ah, the irony! I had to read back through my diary to find out where I had put them, and when I eventually did, I cringed! I had hidden them under my bed, the most obvious place which I had actually forgotten about. All I had achieved was hiding them from myself, it seems! 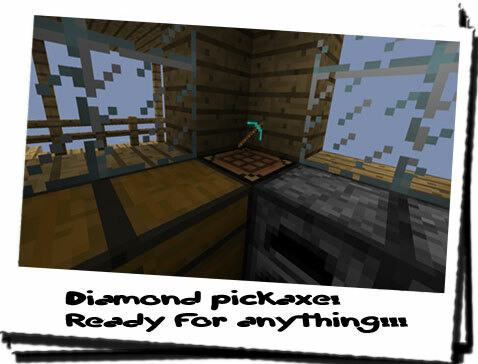 I went back downstairs and started work on the diamond pickaxe! I made a final sweep of the house to make sure I hadn't left any TNT available - I even checked the mine in case - but I couldn't find anything! I retrieved the pickaxe and left the house, remembering to secure the door and reposition the barricades. I exited the same way I entered, and headed towards the pier, when I stopped... I thought I had heard a strange noise near the ship. I headed over to it, readying my bow as I crept closer... I fired a cautionary arrow just behind a small pile of sand where the sound had come from, and a wolf came shooting out in the opposite direction! I wondered if it was the same wolf I had seen running through the gate before I left? It didn't matter, so I returned to the boat and began the long journey back. As I went, I saw strange, black shadows moving deep below the surface of the clear, blue water. They didn't look like a shark, but they didn't like anything I'd actually seen either. This worried me, but as long as they stayed down in the depths, I had nothing to worry about. I think my rowing skills have improved somewhat, as the journey didn't seem to take anywhere near as long as the previous two times! It's nice to know I'm expanding my pool of skills! I disembarked and went to the tent where I had secured Chiron, only to find a small hole at the edge, and Chiron sitting next to the now-extinguished fire! It seems couping him up is futile... However, he seemed happy to see me, and so I took the time to have some dinner and play with Chiron. After a bit of fun, I managed to calm him down with a bone or two, and I went down into the dig site with my new hardware! Today I would make excellent headway with the obsidian wall! I had taken the small sticks of dynamite with me too just in case! I didn't know how thick the wall was, but I was hoping that the dynamite would be able to at least deter anything I came across! I climbed the stone staircase towards the obsidian wall and began immediately hacking at it with the pickaxe! But to my surprise, the obsidian held fast pretty well! After a few more minutes, I had managed to dig out a decent sized chunk of the obsidian, but was really tired! This was going to take more time than I thought. I took out a stick of TNT, lit it and placed it on one of the exposed lips made by miing it! I ran back up the stairs a bit and waited for the explosion. What happened next was less than disappointing; a small bang was heard acoompanied by a flash of light. I went down to inspect the damage, and noticed it had only managed to stain the purple rock with black soot! This stuff was useless! It was dark when I left the dig site; the moon had come out, and was casting an eerie yellow glow over everything. It seemed an especially odd yellowy colour too! I didn't really think much of it; it was just the moon... It's a bit later than I wanted; I really needed my rest with my arms feeling like they were going to fall off, but I suppose any rest would be better than no rest! I checked for spiders before settling down! Did not want a repeat of this morning! Tonight, I would sleep like a baby!